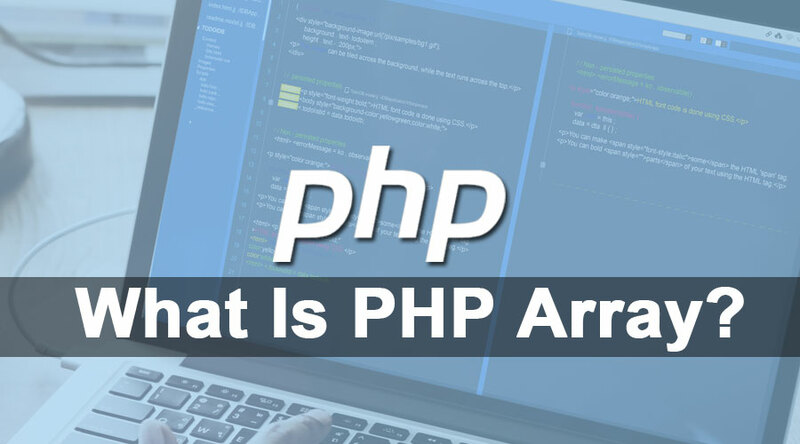 Home » Software Development » Blog » Software Development Basics » What is PHP Array? In this session, we will try to understand every aspect of an array like what is it? How it works and so on. But before we proceed, let me tell you that array is a general concept in programming language and not limited to PHP only. The high-level languages like Java, .Net and python leverage array to solve complex programming problems. Now let’s begin and have some fun with PHP! An array is nothing but the data structure that allows the storage of multiple values under a single name. In simple terms, it’s a variable that is capable of containing more than one values. The values assigned to the array are homogeneous in nature, it means the data type of all the values should be the same. If an array is supposed to be containing the integer value only then it won’t be possible to store character or string values in that. An array could also be considered a collection of items which follows a specific order to store the items or values. Once the array is created, we can assign several values to it. In languages like C, C++ the developer is supposed to assign the size of the array initially but in PHP we are free to add as much of items as we want, and the size of the array will increase accordingly. Now we will try to understand arrays in PHP using the syntax and examples. PHP arrays are implemented by the use of array function which is written as “array()”. It has a very simple syntax that makes the usage of the array very easy. Below is the syntax to declare and initialize the array in PHP. Array_name is the name of the array that will consist of the values. Array() is the function which helps to implement the mechanism of the array in PHP. Values inside the double quotes are the values that are being assigned to the array. Using the above syntax, we can assign the values to the array. Well, can you guess how could we used the values stored in the array? Let’s go and understand the syntax of how array values could be used. Array_name is the name of the array that we defined in the above syntax. Index is the position of the values. For example, the index value of “value1” is 0. So to use them value1 we have to write it like $array_name. How does PHP Array make working so easy? The fact that array makes the working with programs could not be belied. Under this section, we will understand how actually the array makes the work easy and we will consider some examples to get a precise view of PHP array’s capability. Example: The below illustration will accept the name of several students and will print it. Output: The above program will print the name of all the students and below is the output. Below diagram will make the concept of array very clear to you. It shows the order in which values are assigned to the items getting added to the array. In PHP we have two types of array: one-dimensional array and multi-dimensional array. The one-dimensional array may be defined as the type of array that consists of multiple values assigned to the single array. The Values assigned in the one-dimensional array are homogenous in nature that means it allows only the values with the same data type to be added to the array. The way to use the values from the single dimensional array is the same that we have discussed above. $array_name could be used to bring “Value3” in use. A multi-dimensional array may be defined as the kind of array that allows us to assign values in multiple arrays at the same time. The values assigned to the multi-dimensional array could be heterogeneous that means values of different data types could be stored in the arrays and it has to be taken care that the sequence of items of specific data types should be same in all the arrays. Here we will look on two-dimensional array syntax. Well, just for your information, the complexity of array increases as the dimension of the array increases. To access the value stored in two-dimensional array we will use below syntax. What can you do with PHP Array? For simple programs, a one-dimensional array could be very helpful and if the program is somewhat complex than a developer can leverage the multi-dimensional array to get the expected outcome. In PHP, there is no need to assign the data type of the array. It automatically detects the data type by analyzing the values or items assigned to it. In addition to all the features of an array, it’s characteristic of increasing the size automatically makes it favorite among the developers. In the above sections, we learned how an array is implemented in PHP, the way it stores the value and how we can use the values assigned to the array. Now in this section, we see how array could be used together with some of the inbuilt functions to get the desired output. As we know the best way to learn anything is facilitated by examples, the same way we will have a look in an example to dive deeper on working with an array. Example: In this example, we will use count function with the array to find the total number of students in a school. Output: The count function will count the number of items assigned to the array and that will help us find the total number of students. The way we added items to the array is different that we used initially. It has been used here this way to give you an idea of the alternate way of assigning values to the array. Name of the four students are assigned to each index of the array and could be used by choosing the index accordingly. let’s see another example where we will be using the sort and count function collectively to sort the values in the array. Example: In this example, we will assign several roll numbers to the array in some random order and then will make the use of sort function to arrange the order of roll numbers. Output: The roll numbers that are assigned to the array in the random series will get sorted in ascending order. We have been watching out the pros of using the PHP array and now we will be arranging those in a single section. Below are some of the advantages of PHP array that makes it very useful. An Array allows us to add multiple items of a similar type under one name which makes the values easy to access and convenient as well. Though the values are supposed to be of the same data type, we will not need to define the type of the array. The data structures such as linked list, trees, queues are implemented in any high-level programming language by the use of an array. Due to this advantage of an array, the languages could provide a platform to work on complex applications as well. It actually facilitates the way data has to be stored in the memory. The multi-dimensional array allows the developer to perform operations of a matrix by arranging the values in the same manner as it’s kept in the array. The only caution that has to be taken while working with matrix is, the output should be either in a one-dimensional array or in two dimensional, we have chosen the output array accordingly. What all we need to remember is the index number in order to locate specific value. There is no need to memorize multiple variable names as all the values could be called or used using the same name, which is actually the array name. The increasing number of variables also increases the memory utilization by the program as memory is required to be assigned to every variable but in case of an array, memory has to be assigned to the single array that could store multiple values and same unnecessary memory consumption. To work with PHP array you are supposed to know a few basic things about programming like how the values are getting assigned to the array, how should he call them and so on. In order to implement the data structure using an array, one must need to be cognizant about the data structure part along with the working notion of an array. We will also need to have an understanding of variable as an array is nothing but the extended version of the variable. The way variable stores a single value, the same way array uses the index to store a single value and those single values added by the mean of several indexes comes together to form an array. Anyone with a good understanding of fundamental of programming can work with arrays very easily. Why do we need a PHP Array? To get the answer to this question, we have to remind all the things that we have understood so far in this tutorial. It’s an obvious thing that we prefer to use anything only if it offers us some sort of advantages and as an array is very beneficial to us is various aspects, we always prefer to work with array wherever required. While writing the code, whenever we need to store several values for some common entity than the array is the first thing that comes into our mind. As pre discussed, the only way to introduce the data structure in programs is facilitated by the mean of an array. Tree, stack, queue, linked list are some of the data structure that defines the way data gets stored. To implement those data structures, an array is the only and best option. In addition to its functionality, it’s very easy to use. Also, we need it as it provides us an opportunity to mitigate the use of memory. The program developer using arrays are always very efficient and consumes less memory. Who is the Right Audience for learning PHP Array? Anyone who is willing to learn PHP is the perfect audience to learn PHP array. What all it requires to learn array is just the understanding of programming fundamentals. So in more specific words, anyone aware of the basics of coding would be able to understand array smoothly. How Learning Array will help you in career growth? In any programming language, array plays a very vital role and hence required to be used most of the time while developing complex programs. It provides a mechanism of efficient memory utilization that makes it the most need thing while working with an abundant number of data.